Every Llanero should spend an evening at a salt playa being used by sandhill cranes. Salt playas with a foot of water are attractive to cranes as nighttime roosts all winter long. Any hungry coyote makes plenty of noise if it enters the water. After sunset, long lines of cranes come flying in, a graceful aerial chorus line that fills even the most television-callused observer with a spiritual awe. On an Audubon Society Christmas Bird Count a few years ago, on one foggy morning, snow began materializing as if from the heart of the cloud. The fog magnified the emptiness of the plains. 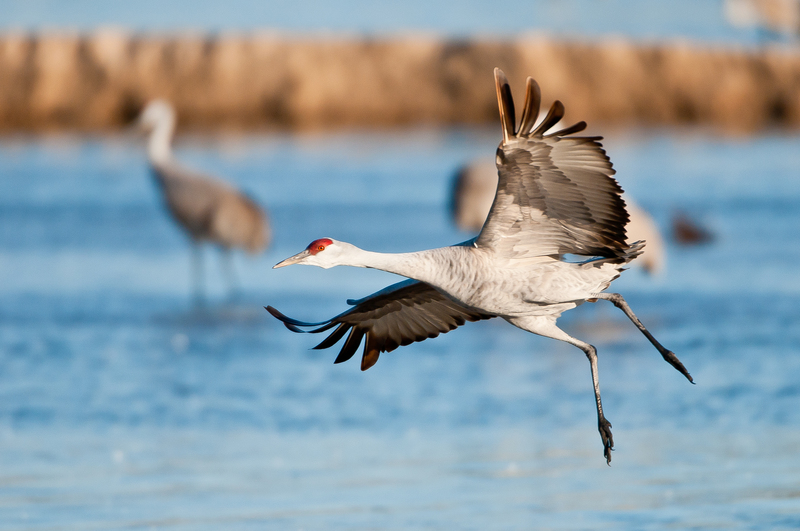 The cranes talked querulously as daybreak light oozed through the grayness. The fog cleared, sifted from the sky by the snow, but the visibility did not increase. My outpost became blanketed by what my mind translated as the soft down feathers of cranes, as they fell silent. I heard a determined splashing, a squawk, then a clamor as what must have been 10,000 cranes struggled to seek airborne safety from what must have been the Trickster personified—a coyote with long antelope legs, able to penetrate soundlessly the watery defenses until its final successful lunge. I heard the coyote splashing to shore as the cranes rose into the snow’s silence. After long minutes of silence I rose and meandered along the shore of the playa, where I found silver-gray feathers, spotted by still liquid blood, the redness the only brightness of the day. The snow lost its softness, became tiny cylindrical pellets, and the wind began to cut through my winter clothing, and my cheeks glazed with cold. It is hard to believe, now, but in the 1980's the salt lake (or playa) 5 miles east of Stanton right on Interstate 20 held water for 12 years without drying up. One of the landowners bordering the lake put up a sign saying "Pleasure Lake, " and built a campground along one of its arms. They even opened up a little convenience store for the sailboat owners that held mini-regattas. Maybe putting wheels on a sailboard will become popular as an indigenous west Texas X-treme Sport, so the playa will be utilized in long droughts. Birdwatchers visit the lake when it has water, to scan for rare ducks and seabirds blown far off course by winter storms. If conditions are right, pelicans and seagulls by the dozens, as well as loons and mergansers, along with hundreds of coots and the usual wintering ducks which take up a playa residence for a winter. The Llano Estacado's playas (which number in the thousands) are the winter home to a substantial percentage of the nation's ducks. When a salt playa is dry, it is a very alien environment. The reflectiveness of the white surface produces mirages of startling intensity. Creatures that die in the floodwaters swept into the playa become mummified. Wood washed into the playa also becomes saturated with the salt as well, and sometimes takes on incredible textures, becoming silky to the touch, and impossibly lightweight. Several of the salt playas in West Texas have springs that will keep a tiny portion of the basin moist. These freshwater springs are the site of a wealth of archaeological artifacts. Native Americans utilized the springs for thousands of years. Quanah Parker, the most powerful of the last free Comanche chieftains, was born on the shores of Cedar Lake, between the present day towns of Lamesa and Seagraves. On the northeast side of the big playas great hills of salt loess blown up out of the basin by prevailing winds provides a habitat for plants that can only live in highly alkaline soils. Gypsophilous plants must endure a soil that wicks water out of plants due to the osmotic imbalance. Some of the rarest plants in west Texas are found in salt loess. For anyone that loves to investigate the out-of-doors, a salt playa is a surprisingly complex environment to explore. Three salt playas are easily visited without trespassing private property. Be sure to stay in the road right-of-way and not cross fences. The north access road on I-20 east of Stanton provides access to Pleasure Lake. County road 1066 crosses Cedar Lake -- go north of Lamesa on State Hiway 137 almost 11 miles and turn left on to 1066 and go 11 miles. North of Andrews on U.S. 385 go 8 miles and turn left on County Road 1967, which crosses Shafter Lake about four miles later. On the south side of the playa is the cemetery of the old town of Shafter Lake, and the landowner allows visitors to access the cemetery. For the dedicated playa investigator, a 100 mile loop can be traced to all three playas -- and we all know that for we Llaneros a hundred miles is "nuthin' atall."